Her simple and serene energy immediately gives a sense of confidence, without once ever giving the feeling of expectations of judgement. The meditation session is a real opportunity to share a moment of quietness, intimacy and closeness with someone who is truly present, supportive and who even makes exploring your strengths and weaknesses a pleasure. Kati Tarro trained as a hatha yoga teacher in 2015, and has spent the last four years focusing more and more on bringing her spiritual practice into the water. It wasn't always easy though - when she first started freediving, she struggled a lot with relaxation and equalisation problems, making her freediving experience a set of challenges, rather than being a story of a natural born mermaid. She had her share of instructors who were unable to help her, dismissing her and telling her to 'just take another course' and suggesting that 'perhaps freediving isn't for you!' - but she continued to try to figure out her problems in water. Despite the challenges and demotivating comments, something in Kati made her continue freediving, to reach deeper into herself and try to understand how she could feel free and happy in the water. 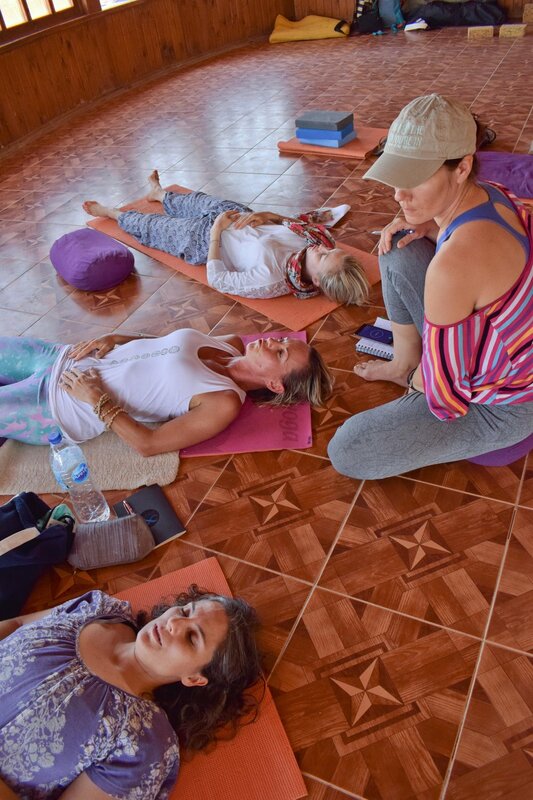 She came to Dahab at the end of 2016 and began to come to my Kundalini Yoga classes where we connected. Soon after Kati reached out to me for help with her equalisation, I quickly realised that the problem lay not in her being 'faulty' or that she wasn't capable of freediving, but in her belief patterns which were holding her back. Through many hours of talking, setting her on a path of daily meditations and self-examination, and her own dedication to her training in the water, she slowly unravelled the knot of frustration and stress, and tricky equalisation and went on to become an excellent beginners / intermediate freediving instructor, teaching from the wealth of experiences she'd gained, both positive and negative. This year Kati was certified in the first class of DYD Coach Graduates - four amazing freediving instructors who now offer intuitive and holistic coaching based on my own personal experience and teachings. These four DYD coaches bring now not only what they have learned directly from me, but their own understand of their personal journeys and paths, as freedivers and teachers and human beings. Kati, being based here in Dahab with me, works alongside me to support me with all of our groups and private students, and will also be running her own specialist programmes for beginners to intermediates, to help them lay the best foundations for continuing their freediving, focusing on experience, rather than performance, and relaxation over effort. As a DYD coach, Kati now teaches the way she wanted to be taught when she was struggling with freediving in the beginning - with personal attention, tailored approach and creating a space for her students free of expectations and judgements. You have many qualities and deserve all the praise, not only as a professional, but also as a person. I know I can count on you, you are a wonderful person, a woman of great value and an excellent professional. Learning is an individual process, but it becomes more interesting when we have as our guide someone who knows how to teach. You were to our students this fundamental support that observed the difficulties of each one, and tried to eliminate them. The way you express your concern, the effort, and the individual attention you have given each student are commendable. Thank you so much for being the excellent teacher that you are! Always with a smile and very solid and reassuring safety I was finally able to put together the pieces of the jigsaw puzzle of equalisation and by the end of one dive session felt that my descents were fully conscious and 100% under my control. I can recommend Kati for both beginners and more experienced freedivers. As a teacher I have studied a lot about positive pedagogy and I try to use it with my students. As a student of Kati in the Masterclass I experienced it in huge amounts. Kati was incredibly supportive and positive. I particularly remember our day at Blue Hole when I was feeling tired and ill, and the meditation triggered things for me and I didn't feel like diving at all. But the sun, the water and Kati's confidence encouraged me to do my best. She made me understand that each small step is huge in terms of personal growth. She trusted me more that I trusted myself and she always gave me super positive feedback. The most important message I took from Kati is to be happy to be there and to enjoy the experience. As an absolute beginner, and with no experience in water outside the cozy environment of a regular pool, I had no idea what to expect of the Masterclass in Dahab. While we flew from Belgium to Egypt, I silently considered showing up for the first 'dive' session and convincing the instructors by displaying my total inexperience that I would be a safety issue for the whole group. I would happily rest on the beach whilst the seasoned members of my group could pratcice and learn. And that would be it. It was my way of letting go - or so I thought. And that was my plan right until we were floating next to the buoy, our group of beginners and little me, wondering what on earth I came all the way to Dahab for. We had met Kati, our instructor, the previous night and our little group had a pleasant chat with her where we discussed our previous diving experiences. Sure Kati was sweet and focused. But I only met her once it was my turn, next to the buoy. She was still gentle, sweet and focused. But there was something more. Something different now. She was in her element, both the water and the teaching. She made me feel safe, and I know I was. She clearly respected my fears and concerns and accepted them with an unusual kindness. She tuned in with intensity - for real. No pretending. My plan didn't seem that good anymore. I can still hear her calm voice as I'm writing. Relax. Enjoy. Try. It was more than kindness and positivity, it was the power of someone who had faith and knowledge and was putting both at your service. So I did dive. And then again. And again. And the days after too. Her focus, her attention, her gentleness never faded. Not a single second. Kati has a gift. Obvious to anyone learning under her supervision. In all areas of life put together, I have never come across such an amazing instructor. She will do lots of good to lots of people.